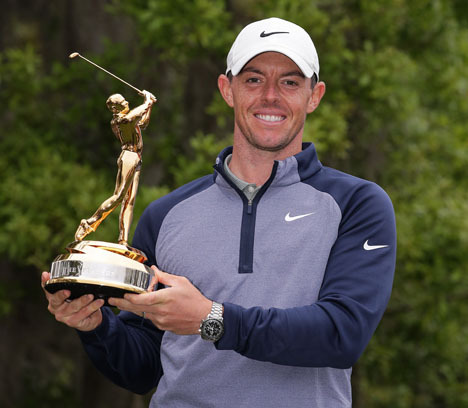 Miami—Rory McIlroy celebrated Saint Patrick’s Day with a one-shot victory at The Players Championship on Sunday, firing a two-under-par final round 70 to claim his first title of 2019. The 29-year-old Northern Irishman overcame a shaky start at TPC Sawgrass to card six birdies against two bogeys and a double-bogey to finish one clear of US veteran Jim Furyk on 16 under. Furyk had surged into contention with a closing 67, a round which included an eagle, five birdies and two bogeys on the challenging Stadium Course layout. The win earned McIlroy a $2.25 million winner’s cheque and could not have been better timed as he prepares for The Masters at Augusta next month where he is aiming to complete a career grand slam. It was another battling performance by McIlroy, who was able to regain his composure at several key moments on Sunday to stay in the hunt. A bogey on the 14th had dropped McIlroy adrift of the lead, but he fought back with birdies on the 15th and 16th to regain a one-shot lead with two to play. The 29-year-old four-time major winner then finished with two pars to close out and seal his 15th US PGA Tour title. McIlroy said his experience on the tour this year—where he has posted five top-10 finishes but has been unable to get over the line—had helped him seal victory. “I think all those experiences I had starting the year helped,” McIlroy said after his win. “I felt more and more confident each time. I just stayed as patient as I possibly could. Furyk meanwhile had faced an agonising wait to see if he had done enough for victory after completing his five-under-par round. The 48-year-old US Ryder Cup captain produced two birdies in his final three holes to close on 15 under. The highlight was a magnificent birdie on the 18th, when he drilled his second from the fairway 172 yards to within three feet of the pin for a simple tap-in. England’s Eddie Pepperell and Venezuela’s Jhonattan Vegas finished tied for third on 14 under after both closing with 66s. Pepperell’s round included a sensational, curling 50-foot birdie putt on the island green on the 17th which had given him a fleeting share of the lead. Vegas managed to outshine Pepperell’s stunning effort on the 17th, rolling in a gargantuan 70-foot putt for birdie. Vegas and Pepperell finished one clear of Dustin Johnson, Tommy Fleetwood and Brandt Snedeker, who shared fifth on 13 under. But it was a disappointing final round for Spain’s Jon Rahm, who had taken a one-shot lead into Sunday’s fourth round. Rahm closed with a four-over-par 76 to finish in a tie for 12th place on 11 under, five adrift of McIlroy. Meanwhile former world number Tiger Woods rounded out his week with a solid three-under-par 69 which left him six under for the tournament. Woods’ challenge at the Players unravelled during Friday’s second round, when a quadruple bogey seven at the 17th checked his momentum. “I was close to getting over the hurdle and getting things rolling, and unfortunately I made a seven over at 17 (on Friday),” said Woods. “I’m excited the way I drove it. I drove the ball well this week,” added Woods, whose next outing will come at the WGC–Dell Technologies Match Play from March 27-31 at Austin, Texas.